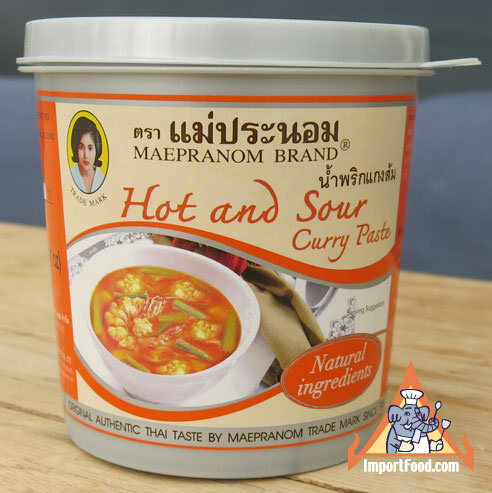 Mae Pranom uses the best ingredients, and always produces a product with true authentic Thai taste. It's very popular in Thailand, most people like it. Mae Pranom just created a perfect "Gaeng Som" paste that you will love, if you like Thai food. You may not be familiar with Gaeng Som because it's not commonly served in restaurants (perhaps because it's not very well known). See the recipe above for a simple way to make it. Served with shrimp, it's an exotic flavor with mild heat and a nice sweet sour touch. Often enjoyed by upcountry people who may not want to spend money on coconut milk. Lead flavors are: sour, sweet, salty. Not very spicy. Ingredients: onion, dried chile, salt, shrimp paste. All natural. This is a variant of kaeng som, which is a popular fish soup that is quite common in Thailand. Keang som is quite sour, and this dish has been given a degree of sweetness in keeping with making it from chicken. This is a popular fish soup that is quite common in Thailand, where it is usually prepared using a freshwater fish "pla chon", or snakehead serpent fish. As an alternative, we suggest using canned herrings packed in brine. It can also be prepared using chicken and chicken stock.